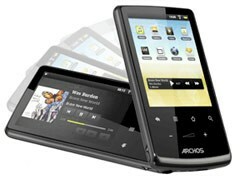 Sure, it's no Galaxy Tab, but the Archos 32, which just began shipping today, does offer some bang for your buck. it's not exactly at the top of the Android tablet heap (or even the Archos tablet heap), but for $149.99, what more could you ask? Other than, of course, a name change (seriously, how does a 3.2-inch device qualify as a "tablet" rather than a "portable media player?") and an operating system that isn't FroYo.